Bushtits seeking insect food in thicket of Coyote brush and Sticky monkeyflower. Photo: © Carol Nickbarg. Observe your garden throughout the year. What types of desirable wildlife are already in your garden? 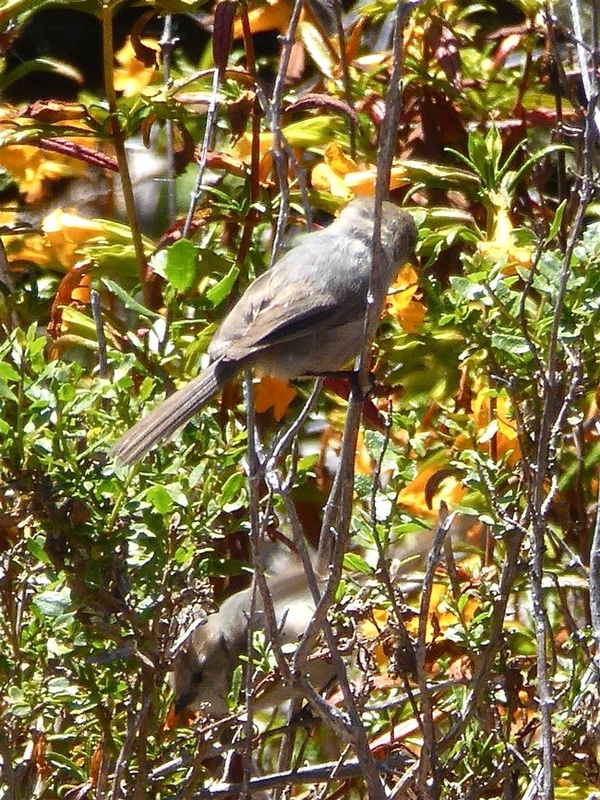 Where in the garden do they appear: plant species/physical feature, shade/sun, feeding/nesting? Do they appear seasonally or year-round? Not all plants (even of the same species) or physical features are alike. For a plant species that thrives in either sun or part shade, one may be more favored than the other depending on the insect, bird or mammal using it. Likewise, birds may not perch on a snag fully exposed to strong winds, but may use the less exposed snag found only a few feet away. Research your area. What kinds of plants and wildlife are native to local areas similar to your property (climate, exposure, soil type, topography). Parks (state, county) and local wildlife organizations are wonderful resources, with downloadable lists and profiles of flora and fauna, often sorted by the different habitats found in local wildlands. Which wildlife species in your area would you like to see in your garden? Which need support and could benefit from your garden? Which plants and physical features would encourage their presence? Physical features need not be large or require major construction. Numerous small and simple features such as a pile of stones, a bee nest structure, a birdhouse can create benefits greater than the “sum of their parts.” What seems minor to us, e.g., a downed branch, may already be host to beneficial decomposers we can't see and used by other wildlife we can. Observe your garden again for undesirable plants, wildlife or features. Choose control methods that will not conflict with your wildlife-friendly goals, e.g., avoid herbicides for weed control, which may also harm desirable plants. Select suitable native plants or physical features. As your garden's overall diversity becomes richer, so will its range of potential habitats and wildlife. Make changes gradually, regardless of whether your garden is young, mature or somewhere in-between: introduce two or three native plant species at a time (vary understory height, flower size and shape, bloom time), two or three types of physical features at a time. For young gardens or gardens with low wildlife presence, start by encouraging insects, then move up in phases to birds, reptiles, small mammals as desired. 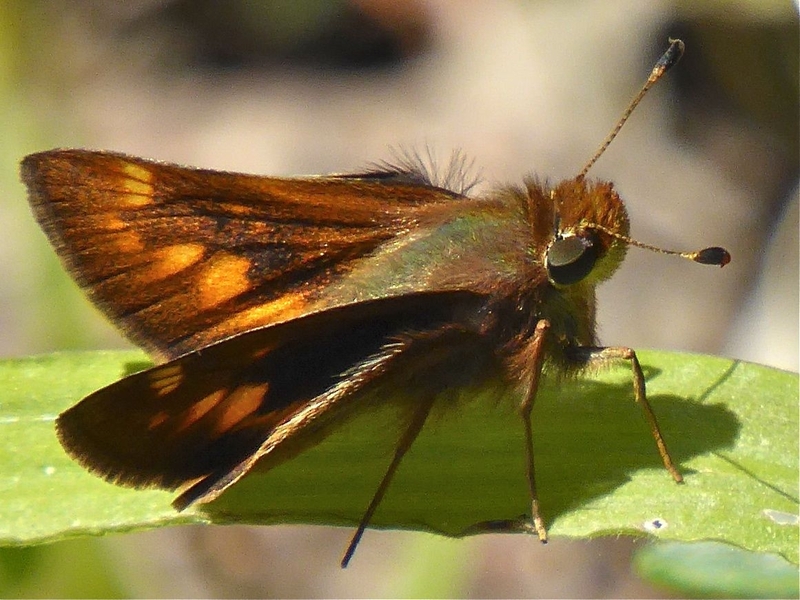 Like true butterflies and moths, skippers are valued pollinators. Larvae feed on leaves of grasses, sedges or shrubs depending on the species. Fallen leaves or other debris from larval host plants also provide hidden habitat for eggs and pupal stages. Photo: © Carol Nickbarg. Research potential risks to family or pets associated with plants or wildlife you are considering for your garden. We provide the following links for you to research your questions about people, pets, and wildlife, but always check with your physician or veterinarian for the final word on potential risks. Check for unique behaviors when researching wildlife. 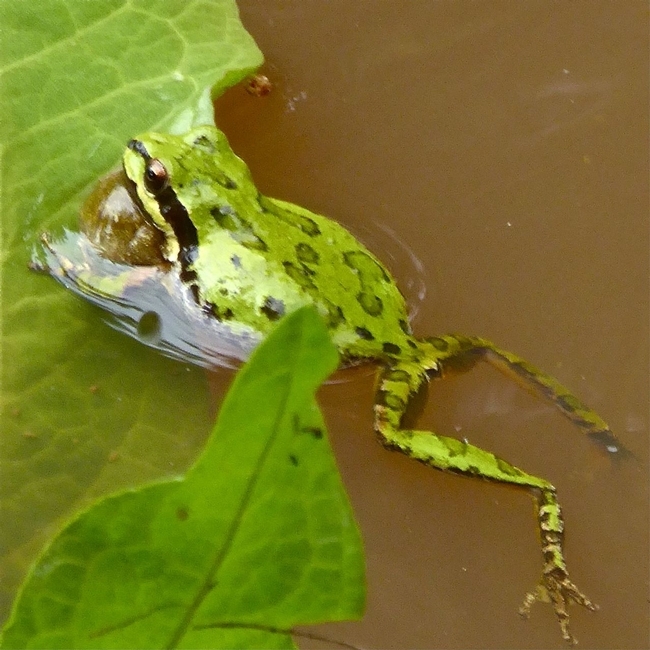 For example, a seasonal pond may attract the Pacific treefrog (Pseudacris regilla), a favorite of this writer's but admittedly very vocal and very loud: one frog's “serenade” to another may become an unwelcome disruption of peace and quiet. Always consult with relevant HOA, city, county and/or other agencies during your planning phase. 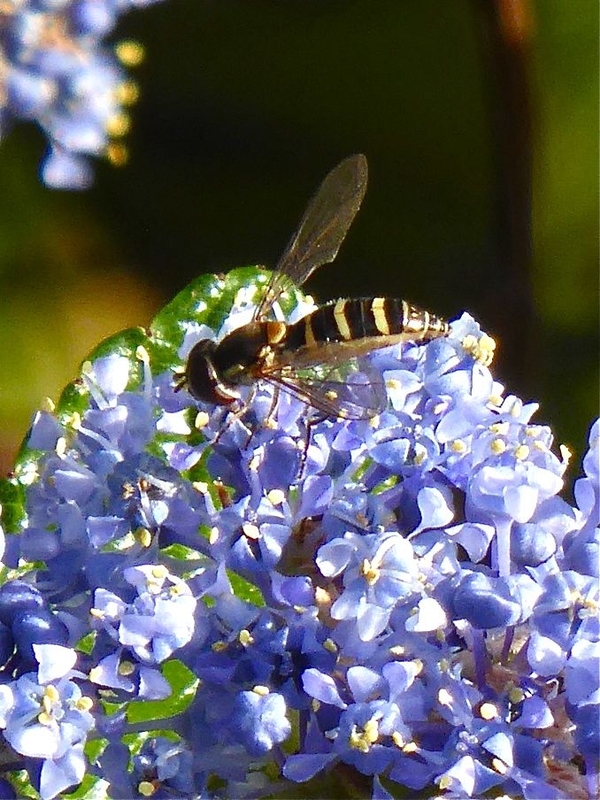 Syrphid fly feeding on Ceanothus pollen. Syrphid larvae are garden beneficials, feeding on aphids, scales, thrips and other soft-bodied insects. Photo: © Carol Nickbarg. Some features or changes (e.g., terracing, drainage) to your garden may require a permit. Some features, especially certain water features, may alter the ecology of your property: as plants and wildlife come to depend on the feature, governing agencies or other entities may not allow the feature to be removed later, even if the feature is man-made. Plant installation or removal: local urban forestry departments or other agencies may have preferred species or “avoid” lists for certain plants in your area; tree or other vegetation removal may require a permit. Regularly inspect any netting or structures to be sure birds, reptiles, small mammals have not become trapped. Regularly maintain birdbaths or other water features. Manually remove weeds and invasive plants. The Gardener's Guide to Common-Sense Pest Control: Completely Revised and Updated. 2013. William Olkowski, Sheila Daar, Helga Olkowski. Taunton Press. Pacific treefrog. Adult diet consists of many kinds of flying and crawling insects, including ants, flies and mosquitoes. An indicator species, its population trends are used to help assess overall health of local ecosystems. Photo: © Carol Nickbarg. We are irrevocably connected to wildlife, sharing a communal ecosystem with permanent and seasonal wildlife of all types and sizes. Happily, for our sense of wonder and to our mutual benefit, wildlife recognizes habitat rather than property lines. Together, our gardens, whether as neighbors or welcoming hostels, can reconnect with other vibrant spaces in our communities to provide continuity and stability of needed habitat and resources. This is the second of a two-part post. To read the first part or check out the rest of the references and resources for this post, visit Part I on our website. For local inspiration, be sure to attend our 2017 UC Master Gardeners of Monterey Bay Garden Tour on September 9th, 2017. More information about the Garden Tour can be found here. If you'd like to purchase any of the reference books mentioned, use our AmazonSmile account! It won't cost you anything but we'll get a small donation with each purchase made through our link. Don't forget to subscribe to our blog so that you receive an email notification when a new post goes up. If you have questions, contact us online, by phone or in person to get answers to your gardening quandaries! Our forecast here on the Central Coast is for lots of rain in the coming days. While it may be too late to implement any big changes for this series of storms, it's not too late to observe what happens with water around your house, in your garden, and in your yard and plan for some improvements that might even change the way you garden. Right now most of that freshwater goodness goes into ditches and drains to the ocean. There are good reasons for this; when rainwater ponds, it may be targeted by mosquitoes looking to lay eggs. In addition to being annoying, mosquitoes can carry diseases. That's a main reason why county Mosquito Abatement personnel go around putting mosquito fish into ponds - so that fish will eat mosquito larvae. Minimum 5-10 ft from structures. Not over a septic system. Not in a place that is already soggy. Ideally in full or partial sunlight. Harvest water from your roof or driveway. Plant when the soil is dry, preferably fall. If your chosen spot has slow soil infiltration rates, soil can be amended to improve infiltration. Mulch your rain garden to prevent weed growth and be prepared for some maintenance as your rain garden is getting established. 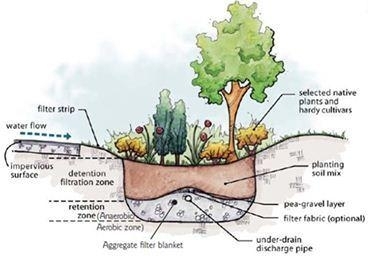 More information on building a rain garden can be found here, here, and here. 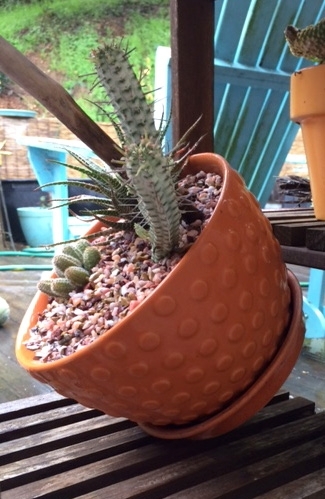 As you are watching all the lovely rain fall right now, don't forget that potted plants can get easily swamped. I put pots likely to drain poorly onto their sides or tilt them at an angle so they drain better. Look around your property to ensure there are not pots, garbage can lids, or other containers that will collect rainwater and allow mosquitos to breed. Check your downspouts to make sure that they are not directing water to your foundation. And then tuck yourself into your bed and listen to the sound of the raindrops on your roof. Don't forget to subscribe to our blog so that you receive an email notification when a new post goes up. If you have questions, contact us online, by phone or in person to get answers to your gardening quandaries.